The first people who inhabited Rwanda were the Hutu. Later the Tutsi people migrated to the territory of modern Rwanda and formed a distinct racial group. Another pygmy people of Rwanda is the Twa, who had to migrate to the mountain slopes. Colonization of Rwanda began in 1884, when Germany assigned the territory of the African state as a part of German East Africa. Germany lost the territory of Rwanda during World War I, when it was taken by Belgian forces. Belgium changed the administrative structure of Rwanda and introduced scaled projects of education, public works, health and agricultural supervision in attempt to reduce the incidence of famine. After World War II Rwanda became the UN Trust Territory of Belgium with a mandate to oversee independence. The Tutsi favored early independence and the Hutu began emancipation movement. The tensions between them rose and led to the Rwandan Revolution in 1959. Pro-Hutu Belgians held a referendum in 1961, ratifying establishment of monarchy. 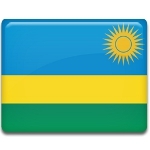 Rwanda finally gained its independence from Belgium on July 1, 1962.